The critics have spoken--this New York Times best-seller is "impossible to put down " Teens and reviewers alike have fallen in love with Demonglass' humor, forbidden romance, suspense, and delicious paranormal fun. Sophie Mercer thought she was a witch, which was why she was sent to Hex Hall, a reform school for delinquent Prodigium (aka witches, shapeshifters, and fairies). But that was before she discovered she's a "demon," and her hot crush, Archer Cross, is an agent for The Eye, a group bent on wiping her kind off the face of the earth. What's worse, Sophie has powers that threaten the lives of everyone she loves. Which is why she decides to go to London for the Removal, a risky procedure that will either destroy her powers forever--or kill her. But once Sophie arrives, she makes a shocking discovery: "someone" is raising new demons in secret and planning to use their powers to destroy the world. Meanwhile, The Eye is set on hunting Sophie down, and they're using Acher to do it. But it's not like she has feelings for him anymore. Does she? It’s been more than a year since I’ve read Hex Hall and I admit I don’t quite remember everything about the ending, but Demonglass sets in pretty soon afterwards. Sophie’s dad, head of the Prodigium Council, wants Sophie to stay in England with him for the summer. By spending time with her and teaching her about her demon powers and heritage, he’s hoping to change her mind about going through the Removal, a ritual which would strip her of all her powers – if it doesn’t kill her, that is. Her father doesn’t want her to undergo it because the threat of L’Occhio di Dio is greater than ever after Archer’s betrayal has been revealed and the organization has struck an alliance with the Brennans, another set of Prodigium enemies. Also, he wants to show her that it’s possible to be a Demon without being a monster. Then there is, of course, Sophie’s love life. she knows she should forget about Archer but she’s having a hard time. going to England, where he’s allegedly been sighted, evokes conflicting feelings. Oh , and did I mention that her dad betrothed her to Cal years ago? To be honest I didn’t even remember there was a character called Cal ^^’’ He’s Hex Hall’s groundkeeper and has the strangest healing powers of anyone around. He’s a bit hard to read but a genuinely good, caring guy. After her initial shock of being fiancéed without a say in it, Sophie grows to actually like him. Then there’s England itself, and Thorne Abbey where Sophie and her friends are staying with part of the Council members. Very strange to Sophie & co. Very British – a little too clichéd sometimes for my taste. And imagine Sophie’s surprise when she meets two other demons there! Nick and Daisy don’t remember anything from their lives before they were forcibly changed into demons, and their attitude to their powers is very different from Sophie’s denial. Sophie begins to use and control magic again but still fears to turn into a monster the way Alice did. When a conspiracy is revealed after multiple attacks and things start going to hell in a handbasket, can Sophie protect those she loves? And does that include Archer after all? Sophie shows quite a bit of character growth and learns from her mistakes in this installment, which I liked. So does her father and I enjoyed seeing their relationship develop. Also we learn more about Prodigium organization and law as well as Sophie’s faily history. Her feelings for Cal and Archer don’t quite turn into a love triangle but I liked the loyalty conflict they cause for her. The pace is a bit slow at the beginning but picks up quickly with plenty of mystery and action to keep the reader entertained. The book is very hard to put down near the end, which leaves many questions open and makes me want to pick up the concluding book as soon as it’s out in paperback. My problem, both with Demonglass and Hex Hall, is that I can’t quite get into the writing, or the voice I should say. The whole teen thing seems a bit forced to me. Yes, there are witty comments and some sarcasm, which I usually love, but here it just doesn’t quite ring true or hit the mark for me. That makes me aware of being a bit above the target audience age, which I’d put at 13-18. I don’t know, maybe younger teens are more into it and it’s just me. Also, part of the plot was a little predictable, though I didn’t foresee everything and there were some nice twists and unexpected revelations. 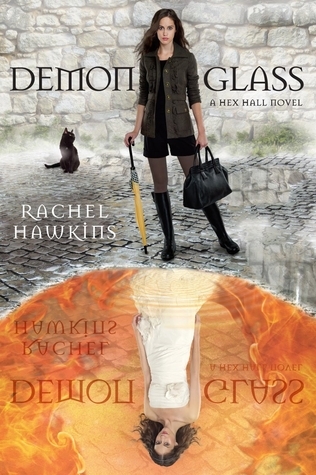 All in all, Demonglass is a solid read for teens and takes everything in Hex Hall up a notch. There’s character development and a focus on greater-scale conflict rather than drama, which I liked. There’s action, suspense, and some romance. I liked the novel, it just wasn’t outstanding or one of those books that linger in my mind and truly make me think. What did you think of this one? I'm really curious whether I'm the only one having a problem with Sophie's voice. Do you like the book/series? I still haven't gotten my hands on this book, but I really want to! I loved Hex Hall. Been searching my library's digital book options to see if/when it gets added. If I run out of things that I want to read from the library, it'll be getting picked up. I loved the characters and how evil that one girl was being to Sophie (can't remember her name, but I do remember things like how she had a hard time making her dress...Think that was this book; been awhile). With all the drama near the end of the story, I wanted to read book 2 right away and was so disappointed that my library hadn't followed the series releases.